Previously on Survivor, it sucked. We’re still grieving the loss of the Mayor of Slamtown, who was every bit as fun, kind, and entertaining as we had hoped he would be prior to the start of the season. At this point, it does seem as though the tightest group is the Davids, even if they don’t quite have the numbers. The Goliaths have little schisms here and there, with Alec knowing that he has to break from them at some point soon, and Alison feeling much the same. And then there’s Angelica, the bottom person in the Goliath alliance, who would be well served to make a move since there’s little love remaining for her amongst her peers. Back at camp, Davie is super excited that he just eliminated John, the Mayor of Slamtown. He even has the spoils of war – a professional wrestler’s jacket. It could only be better if it belonged to the Elite or maybe Marty Scurll. Davie will never make it to Wrestlemania, but he feels like he’s in the main event right now. 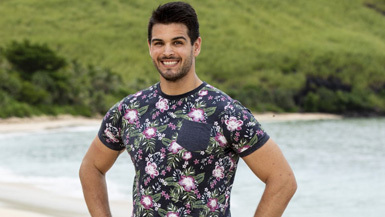 He also makes a comment to the group that by Survivor 37, everyone should appreciate their competitors’ gameplay without taking it personally. It’s rare to see a Survivor player own their move and be this transparent. The move could pay additional dividends, because he has largely claimed that move as his own. Alison, Kara, and Alec sit together as they chat about what just went down. Both Alison and Alec are worried that they’ve stayed true to the Goliath alliance for too long, especially since both of them have made overtures about making “a big move.” Also, Alison worries that the Davids may have dug up a hidden advantage, which could totally flip the script. They notice that Dan is off by himself, pouting. And it’s true. He is. He pouts that the vote went the wrong way and that he played his idol on the wrong person (that’s on you, buddy). He pouts that the other three are off in a group talking to each other and excluding him. And he pouts because he thought he had a showmance with Kara and it’s not going the way he expected. Dan feels like he made a sacrifice (his idol to Angelina) for nothing. We’re still not sure why he let her nag him into it. None of the other Goliaths would have cared if she’d been eliminated. Probst is here. It’s time for a Reward Challenge, with teams chosen by random draw. They start with an obstacle area to get a bag of numbered tiles. The tiles combine for a combination that releases a key, and the key unlocks a snake puzzle. The prize for the winning team is a burger bar with beer and/or soft drinks. Since there are an uneven number of people, someone will be left out from the start. That someone is Carl. One team has a clear physical advantage – Alec, Davie, Dan, Kara, and Mike. The other team is Gabby, Alison, Nick, Christian, and Angelica. Of note is that the combination portion of the race is the same for both teams. If one solves it and the other team sees it, they can get the answer. Thus, even though Mike solves it quickly, Christian is able to figure it out from their result. The snake puzzle pits Alec and Kara versus Christian and Alison. Both pairs are communicating well. Still, that slight lead given them by Mike allows Team Orange to get the burgers for their team. Gabby talks about how this is an opportunity to work with Alison. She manages not to cry during this brief confessional. Impressive! That’s okay, though. Angelica takes up the slack. She cries over the fact that the burger bar includes veggie burgers, and she’s going to miss out. Following up on her plan, Gabby talks with Alison about potential cracks in the Goliath alliance. She tells Alison that her big plan to write down Angelica’s name wouldn’t have been that big of a move. Honestly, Alison is a little too obsessed with the big move. The point is always just to make sure your name isn’t written down. Over at the burger feast, Davie wanders off on his own, allowing Mike to tell his teammates that they should stay Goliath strong, with Christian being the vote. Kara, however, wants to eliminate Dan. In hopes of gaining the trust of Alec and Alison, she tells them that Dan has an Immunity Idol. Alec laughs at him in confessional. The number one rule is not to tell people you have an idol. Thus, the three of them plot to eliminate Dan, but Alison worries that they could get blindsided if they split from the majority. Honestly, she’s overthinking this stuff.